Some call them a stinger. Some simply call them a post credits scene. Some are really looking forward to Venom. And some are dreading that this may not be the adaptation we've needed for the character. But one thing is now certain. This franchise cinematic launch for the character has been verified to feature two added bonus scenes once the film ends. Early reports from press screenings are saying that both post-conclusion scenes are bunched together prior to the credits rolling. In this weird universe, we're not really sure what they'll be teasing since it seems like this Venom may not be part of the shared Spider-verse. However, who really knows at this point? 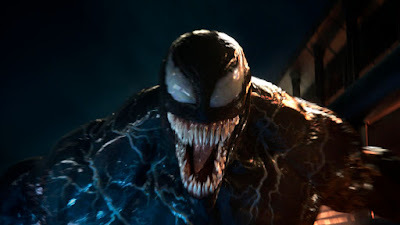 With the next movie from the Sony/Marvel pairing being Morbius starring Jared Leto in the role, which hasn't started filming yet, we can only imagine the scenes will most likely tease a Venom sequel. Since the film is still under embargo, no one is releasing any info.